We tried using this Wok Ring with our Mandarin Wok but it doesn't fit on our gas burner. Maybe it would be nice on an electric burner. We appreciate your review, Sarnen! If you are having any issues with the product you have purchased, please contact our Customer Solutions team. This thing is paper thin and mine was beaten up when it arrived. The edges are sharp and when I bent it back, my dishwasher cut open her hand. Don't get this thing! Thank you for the review, Michael. We're sorry this did not suit you. Remember our Customer Solutions team is always eager to help should you have issues with your order. Sturdy enough to handle the big wok we also purchased from this site (14" mandarin wok). This was the right price, and a must for someone working the wok and a zillion other things at once. I used this for the first time a couple nights ago. And as far as I can tell it is high quality for the price. I will not hesitate to purchase another thank you. Thought I would start doing a little cooking with a wok. This product really makes it easy and the price can not be beaten. Low shipping as well. I have to say, I never thought I would find this kind of thing here. I used to have this in the restaurant and watches those chefs working on food. This ring stands perfectly on the stove when you have a round bottom wok, This is a must have thing in the kitchen. Fits on my gas stove perfectly and works wonderfully with my 14" wok (item #88534702). It's a little light, so it can move around a bit with vigorous stir frying, but it's manageable. Pretty standard wok ring, does the job. Using it with a 14" wok on a natural gas stove, love this way more than just trying to use a flat bottom wok. Pro tip, flip it over for more intense heat if needed, or if you are trying to use a wok on a electric range. The wok ring slides around A LOT during use on a basic apartment stove. I have to adjust it several times when cooking with the wok. I think a wider ring would be more suitable and slide around less. We appreciate your review, Noah! If you are looking for more information on the product you are purchasing, please contact our Customer Solutions team. This wok ring is really convenient. I have a smaller wok I use it with as well. It is sturdy, pops right into the dishwasher and hangs on my pegboard for easy storage. A real keeper. Perfect companion for my 14" wok. With the help of my wok ring, I can easily make stir fry variations on my electric stove top. My only reservation would be that it's a bit light weight. Thus, it moves around to much during the cooking process. That does not stop me loving it though. This wok ring does its job, is light, and is low priced, and works for a variety of wok sizes. Whats not to love? Yet another great item from The Webstaurant Store. This wok ring fit my 14" wok perfectly. They are cheap enough to just replace with worn out. It was definitely better cooking with it than without it. The 10" wok ring is a must have for any gas burner when using a wok. Can also be used as a stand for sitting the wok in afterwards. Cheap and does the job: it supports the wok perfectly. Didn't get to try it on a gas range or electric radiant, I only use my work on my charcoal grill with a fancy tray so this one is used to keep the work steady when not on the grill. I puchased this wok ring to go with a large Mandarin style wok for our cafe. It sits on top of the grate over our gas stove. Can't beat it for the price. Perfect for my 14" Mandarin Wok! I thought it would turn color, but it's still like new! A must for anyone who stir-frys often; keeps round-bottomed wok stable while cooking. This wok ring goes great with any stove what so ever. turns any house hold burner into a wok burner. really great to have for anybody. 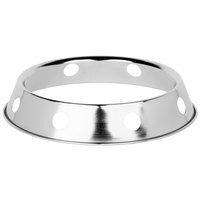 Don't forget to purchase this 10" Wok Ring to go with the 14" Cantonese wok. A must have to keep that perfect cooking temperature accurate. This 10 inch wok ring works wonders if you have an electric stovetop! Nicely keeps the wok secure and just the right height above the stovetop!